A link to an online survey about housing options in Birmingham’s neighborhoods is beginning to be more widely circulated. It is being conducted by GCR, Incorporated, a consulting firm based in New Orleans, LA, as part of a study being used to develop a housing plan for the city. The one year contract (not to exceed $95,139) was first approved by the City Council in June (summary item 2), with the legislative body recently receiving an update during a regularly scheduled meeting. As reported by Fox 6/WBRC’s Alan Collins, councilors did raise concerns at that time about wanting to make sure all residents interested in participating were able to do so. They were particularly concerned about those citizens without online access. The survey is web-based, takes approximately 10 minutes to complete, and is built to be accessible by smartphone as well (the portion of a screenshot from a mobile device accompanies this post). UPDATE: 4:05 p.m. – We’ve learned physical copies of the survey are available via the city’s community development office (as it is that office working with the consultant) and not the economic development office as mentioned in the report. The final report, focused on establishing a policy leveraging tools already available to the city, is scheduled to be delivered to the city in December. It, like the recently established Land Bank Authority, was outlined as a necessary next step by the city’s comprehensive plan process, possibly proving helpful as efforts to establish framework plans continue to move forward. It will also be interesting to watch as the plan is unveiled how it tackles vacant property, affordability, and homelessness, particularly as other cities currently contemplating implementation of housing plans (such as New York and Seattle) move forward as well. 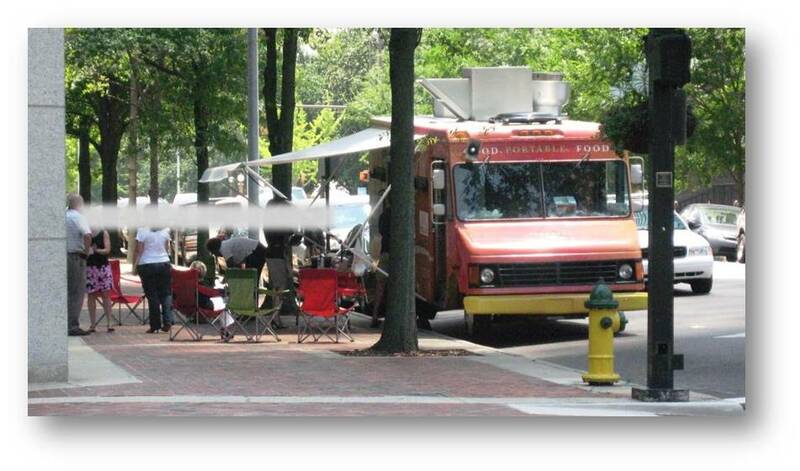 See updates below | It’s been a long time since anyone’s talked about the issue of food trucks here in Birmingham, AL – relatively speaking. It’s been nearly two years since an episode that eventually led to ONB announcing and then changing its stance on them. It’s not hard to find folks supportive of their existence based on the crowds that gathered for two different events built around them in the metro area held on the same day back on May 12. If nothing else, folks are more aware of just how many options they have. Some residents are wanting to make sure that members of Birmingham’s City Council are aware of how many people enjoy the options currently available to folks who work, live, and visit our fair city. They’ve already garnered about 75 virtual signatures as of 10 a.m. this morning on a Change.org petition asking our municipal legislative body to establish policies that support them when possible (and they’ll probably reach their goal of 100 well before lunchtime). Early Wednesday evening, July 11, the owner of Spoonfed Grill shared an update from a Birmingham City Council meeting where new regulations were being discussed. It’s been interesting to look at the conversation taking place on the petition’s page, particularly when you look at what some who aren’t signing the petition are saying about whether or not other issues facing the area need the same level of opinion. UPDATE 3 p.m.: According to a post this afternoon on Magic City Post, the total number of signatures being sought has been raised to 500 – and its nearly reached that goal as well. UPDATE 5:27 p.m.: The Birmingham News is now reporting that the new goal for Naomi Anderegg’s effort is 1,000; it’s currently at 617. UPDATE 7/15, 8:50 a.m.: A quick check of the petition currently shows the new goal as being 1,500 signatures with more than 1,160 already collected. Efforts included establishing an E-Pal program with Rosh Ha’ayin, Israel that now includes two schools there and four in Birmingham, enabling more than 300 students to communicate each week via email and video conference. It also included several art exchanges with sister cities Guadiawaye, Senegal; Hitachi, Japan (where they helped organize disaster relief following last year’s earthquake and tsunami and sent two local college graduates to serve as English teachers for two years); Karak, Jordan; and Plzen, Czech Republic. Representatives of the commission, established in 1982, will have the honor of attending a ceremony recognizing the honor with other winners in Jacksonville, Florida (currently scheduled for July 14). This Saturday morning some folks will head to Talladega for Sunday’s race, Tuscaloosa for the Crimson Tide’s annual battle with Tennessee, and area households and watering holes to prepare to watch Auburn’s game against LSU. Organizers hope a large crowd will also be gathered at the Birmingham CrossPlex on the city’s west side between 9 a.m. – 1 p.m. – ready to help shape the city of Birmingham’s future. Those in attendance will be participating in the citywide visioning session – kicking off public participation in the city of Birmingham’s first comprehensive plan since 1961 (and announced back in July by Mayor Bell). This process – The Plan – appears to be shaping up to be a more holistic one than what was carried out then – perhaps with some sections looking at issues similar to the audit conducted at that time (delivered only in draft form) and available as a PDF thanks to The Heaviest Corner. Maybe we’ll see some comments tomorrow about how the session went? NOTE: Terminal Station Master André Natta is a member of the Comp Plan steering committee (full list as PDF). A search of the site in recent weeks may have led you to a page labeled SeeClickFix (though there wasn’t anything on it). That changed last night. That’s when we became the latest site to add a SeeClickFix widget. The service launched in late 2008 and we’ve been talking with them about its potential in Birmingham, AL since early 2010. Think of it as a digital 311 system. Non-emergencies reported via the widget embedded on our site or via any of the mobile apps available are shared directly with City Hall’s 311 Call Center. As you can see, folks are already using the service to report issues. The more folks using the service, the more effective it can be. Video and photo submissions are also accepted. Selfishly, it also provides an opportunity for local media outlets to get an idea of what’s going on out there (though nothing really replaces face-to-face – or just getting out there – but it helps). Hop on over, check it out and spread the word! This morning’s Birmingham City Council meeting is already underway as I’m writing this and there are several items on the agenda of interest. Item 27 is the first reading of a change to the city code that would alter the look of our city streets. The change would allow our transit authority, the BJCTA, “to advertise on bus stops, benches, and/or shelters” providing a new revenue stream to the agency. The item was withdrawn by Councilor Rafferty because of an addition that needed to be made to the item. Items 29 & 68 will make those who owe overdue taxes and parking fines respectively at least a little happier. It would allow for an amnesty period (the month of November for taxes; October and November for parking, traffic and other non-moving violations) for people to pay the amounts due without having to worry about the penalties. Council meetings are streamed live weekly and archived on the city’s website. The Magic City looks more like a winter wonderland this morning than normal after a snowstorm passed through the city yesterday afternoon and evening, leaving the city with a rare 1-2″ inches of snow depending on where you were. Whether at the Railroad Park construction site, the Birmingham Green (shown here) or over the mountain, It looked pretty cool yesterday and it’s a safe bet that you thought so too. A photo gallery’s been set up on the site to showcase snowfall images you may want to share from yesterday or today. A few photos have already up too and we’re hoping that you’ll feel like adding yours to the mix. There will be definitely be some additional photos posted during the day from the site’s contributors. Hopefully you were able to stay safe last night as roads iced over and area officials made the right decision to close most state highways and access to elevated portions of metro Birmingham interstates. Continue to use caution while out there this morning.